For me, On the Town is joy. Pure joy. I loved the first film Frank Sinatra and Gene Kelly made together, Anchors Aweigh (1945). I also enjoyed their second collaboration, Take Me Out to the Ball Game (1949), but On the Town is the enduring classic of the bunch. It takes everything that worked about their previous two pairings and adds more comedy and a dizzying parade of New York City locations. Normally musicals aren’t my favorite genre, but I love Gene Kelly’s dancing (who doesn’t?) and I love Frank Sinatra’s singing (I know not everyone does, but if you don’t, let’s just agree to disagree), so Anchors Aweigh was a pleasant surprise when I first watched it several years ago. Since then, I’ve warmed up to the Technicolor musical extravaganzas of the 1940s. Musicals still aren’t my thing, but the candy-colored singing and dancing spectacles from Hollywood’s golden age are extremely impressive. At their best, like On the Town, they weave a magic spell that enthralls even a curmudgeon like me. 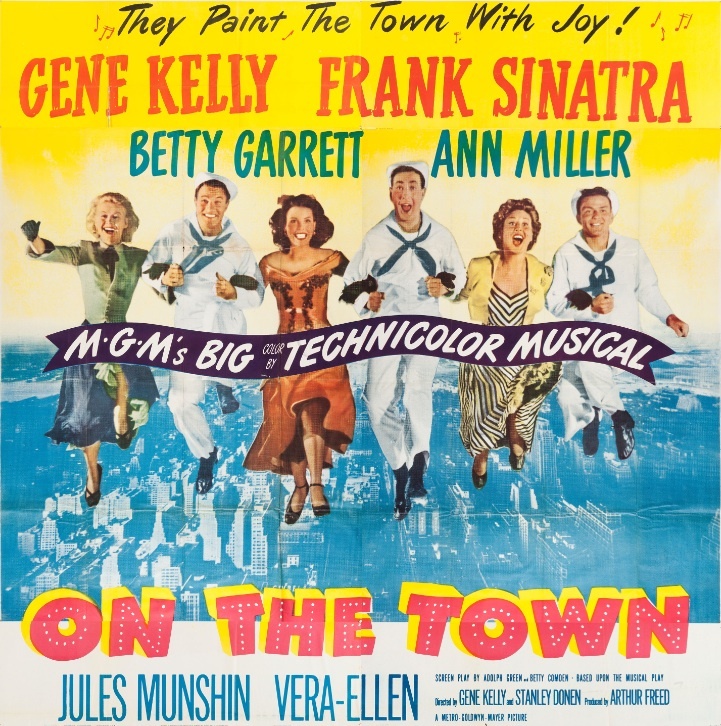 On the Town stars Gene Kelly, Frank Sinatra, and Jules Munshin as Gabey, Chip, and Ozzie, a trio of sailors who have 24 hours of shore leave to tear through New York City and paint the town red. Ozzie is pursued by a beautiful anthropologist named Claire Huddesen, who’s played by Ann Miller, whose dancing I found mesmerizing. She thinks Ozzie is a perfect example of “primitive man,” and wants to study him. The song and dance routine in the Museum of Natural History treats anthropology as the study of “ooga booga” stuff, which is potentially offensive in these more enlightened times, but I found it all tongue-in-cheek enough to be entertaining. On the Town is based on a Broadway play that premiered in 1944. The book and lyrics were by Betty Comden and Adolph Green, with music by Leonard Bernstein, based on an idea by Jerome Robbins. There’s a bit in the film that pays tribute to the original play, when Gene Kelly imagines his New York adventures set to music on stage, and it’s a wonderful moment that focuses solely on choreography. On the Town is an exuberant romp that had me smiling from beginning to end. I can’t remember the last time I enjoyed a movie so unreservedly. Posted in 1949, December 1949 and tagged Ann Miller, Betty Garrett, Frank Sinatra, Gene Kelly, Jules Munshin, Leonard Bernstein, Metro-Goldwyn-Mayer, Musicals, Stanley Donen, Vera-Ellen. Bookmark the permalink. Nice review on On the town, i never heard about it before, but now i will watch it soon.